Sue’s vocal music is easily accessible. All her songs have piano accompaniment. Some of Sue’s vocal music is orchestrated with parts available for strings and wind. 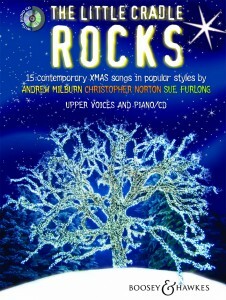 Catchy, rhythmic, lyrical, and comic vocal music for all ages is available on suefurlongmusic. Inside you will find a diverse treasure trail of original songs for children and choirs of all ages, stage music/dramas and popular arrangements for all occasions. Whether you are looking for a Christmas pop song, with ready-made backing tracks already available for instant impact, or a finely crafted part song with either piano or orchestral accompaniment which you can enjoy working on with your orchestral ensemble, your folk group, your community choir, you are sure to find something to enjoy. The resources you will find at Sue Furlong Music are only a small representation of Sue’s creative library, so if you make repeat visits over the next few months, you will find even more new and interesting works. One such example will be The Voice Thief musical for children,with 8 catchy, and moving songs and a touching script which caught the imagination of a full Birmingham Symphony Hall in 2010. Sue is an award-winning, published composer/songwriter, whose prolific output has excited editors to keep coming back for more. So enjoy your singing and music making, and be sure to contact Sue if any questions arise, and she will personally get back to you. If you are looking to commission work for your choir or simply discover new music I highly recommend you make contact with Sue Furlong. Sue is one of Ireland’s treasures when it comes to choral music composition. Not only is she an accomplished choral music composer and pianist Sue has led choirs she has worked with to national and international acclaim. I had the privilege of commissioning Sue to write for Aspiro’s 10th Anniversary. We approached Sue to set a text that was familiar to the choir –“Our Deepest Fear” by Marianne Williamson, which has also been attributed to Nelson Mandela who is said to have used it at part of his Presidential inauguration speech. (See SATB/SAB category). Not knowing how many Tenors and Basses we would have the following year in our Youth Ensemble Sue agreed to write it for SAB / three-part mixed. It was a collaborative commission where Sue visited some rehearsals during the learning process. It was great to have this support from Sue. Sue also arranged“Our Deepest Fear” for SATB with optional instrumentation. Sue has a great understanding of voices of all ages. I have also had the opportunity to teach and conduct her ‘Peace Songs from County Wexford’ and ‘Beir Me O’ with the young members of Aspiro and RTÉ Cór na nÓg and I plan to do Sue’s‘Lord Of The Dance’ in the near future.